The TESTERS included in the Perfect Face sample kits are 7ml each ( 4 testers per type). The BLISTERS included in the Classic sample kit are 2gr each. (4 blister per type). FAQ>br /> What is the difference between Classic Foundation and Perfect Face? THE MAIN DIFFERENCE IS THE TEXTURE:CLASSIC IS A MORE COMPACT FORMULA, WHILE PERFECT FACE IS MORE CREAMY FORMULA. THE COVERAGE IS STILL VERY SIMILAR (BOTH PROVIDE VERY HIGH COVERAGE). 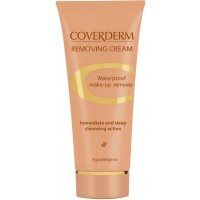 CLASSIC A BIT MORE COVERING, AND WHY WE RECOMMEND IT FOR THE MAJOR SKIN IMPERFECTION. PERFECT FACE IS MORE EASILY APPLIED, AND WHY WE RECOMMEND IT FOR THE EVERDAY/COMMON IMPERFECTIONS. ALSO, PERFECT FACE PROVIDES SPF 20, WHILE CLASSIC PROVIDES SPF 30. LASTLY, THE PACKAGING IS DIFFERENCE OF COURSE, CLASSIC – JAR OF 15 ML/18GRAMS, PERFECT FACE – TUBE 30ML/36GRAMS. strong>Is 9 the darkest colour in the Coverderm camouflage spectrum? 9 IS ACTUALLY THE LIGHTEST COLOUR OUT OF THE COLOURS:6,7,8& 9. THE COLOURS 9 & 6 ARE VERY CLOSE, BUT 9 IS SLIGHTLY LIGHTER. SEE BELOW CHART FOR INDICATION OF THE SHADES.YOU CAN SEE WHEN YOU APPLY ON YOUR SKIN. ALSO, NUMBER 8 IS THE DARKEST SHADE IN THE STANDARD 12 SHADES BELOW. THE COLOUR WILL LIGHTEN UP A BIT AS IT IS APPLIED. THIS IS WHY WE ALWAYS SUGGEST THAT THE MAKEUP IS APPLIED ON THE SKIN TO TEST THE IDEAL SHADE. THE COLOR CHART IS ONLY FOR INDICATION. 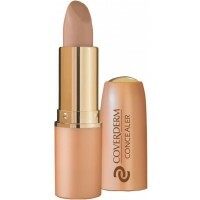 Can you use a foundation brush with both the Coverderm Classic Foundation and Coverderm Perfect Face? YES, YOU CAN USE A BRUSH IF YOU PREFER. BOTH CLASSIC & PERFECT FACE COME WITH THE APPLICATION SPONGE. SO, YOU CAN USE YOUR FINGERTIPS, SPONGE, OR BRUSH. WHAT EVER WORKS BEST FOR YOU. Does your face go oily after a few hours of putting on the foundation? IT DEPENDS ON THE CONDITIONS/INDIVIDUAL. IT IS POSSIBLE TO HAVE SEBUM/SWEAT APPEAR AFTER SOME TIME (THIS IS COMMON FOR ALL MAKE-UP) BUT NECESSARY THE NORM. THAT IS WHY IT IS ALWAYS RECOMMENDED TO APPLY THE FINISHING POWDER (OR COMPACT POWDER)TO SET THE CAMOUFLAGE MAKE-UP, AND TO MAINTAIN THE MATTE, NATURAL LOOKING EFFECT THROUGH THE DAY (IE; TO ABSORB THE SEBUM). NOTE: OUR CAMOUFLAGE MAKE-UPS DO NOT EVAPORATE WITH SEBUM/SWEAT LIKE OTHER MAKE-UPS, AND IS PROVEN TO LASTS UPTO 24 HOURS, EVEN UNDER EXTREME CONDITIONS (HOT/HUMID WEATHER, ETC). 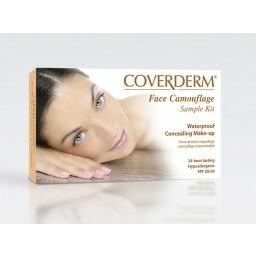 Re:Coverderm Face Camouflage Sample Kit What is the size of the sample kit per items. I understand that there are four? The TESTERS included in the Perfect Legs fluid sample kits are 10ml each. (3 testers per type).